You can also choose different inner cup diameters among five different types of cups, depending on its depth.It is advisable to consider a compact, rich, and fundamentally projecting sound. A cup is the deepest, B, C and D are the intermediate, and E is the highest. 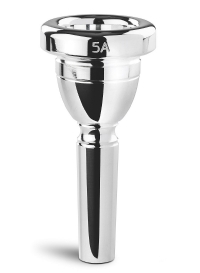 The mouthpieces can be manufactured in silver, gold or combi plated (gold rim and silver body).